In one of her last engagements before she leaves the charity, Camilla Wood gave the club an update on the work carried out by this organisation and presented some alarming figures on the projected growth of cancer over the years ahead. She detailed many of the activities Macmillan Cancer Support deals with and, like all charities, their desperate need for funds to continue the work. 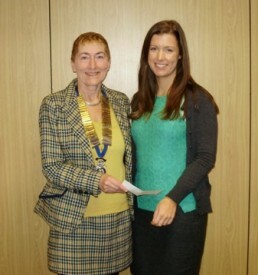 The picture below shows President Jackie Crampton (left) presenting a cheque for £1000 to Camilla, who received it on behalf of Macmillan.